Electrical goods retailer DSG International - formerly known as Dixons Group - is to open its first Electro World store in Poland. The move is part of its strategy to accelerate its store opening programme in central Europe. 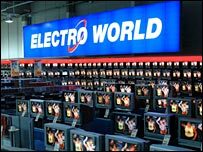 Up to 20 new Electro World stores will be unveiled in central Europe as soon as possible, the company said. The company's European expansion plans are designed to offset weakness on the UK's High Street. The first Polish store will open at the Targowek commercial centre in Warsaw, with a second store due to open in the run up to Christmas. The next opening in its expansion drive will be at Tabor in the Czech Republic. In April this year, DSG announced plans to grow the number of PC City outlets in France to about 100 from its holding of seven. International operations now account for more than a quarter of the retail group's turnover. "Electro World now has a strengthening foothold in markets with a combined population of more than 65 million," said DSG's chief executive John Clare. Aside from Dixons and Electro World, DSG owns PC World, The Link, PC City and Mastercare.